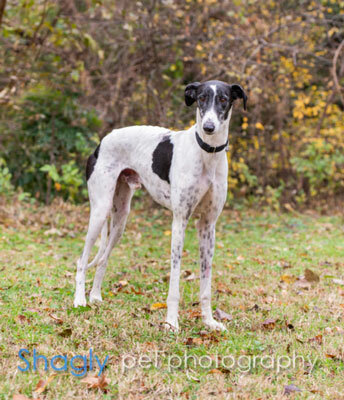 Troy is a a black and white male picked up as a stray in Fort Worth. He is estimated to be 1.5 years old. 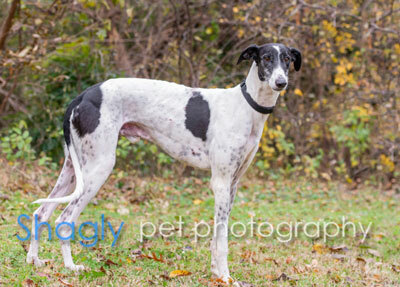 Troy is living in a foster home with other greyhounds. Troy is not small animal nor cat tolerant. He is going to be so very excited to have his own forever home! Troy is the happiest dog. When he walks, he prances. When he runs, he bounds through the air. Of course, his tail is ALWAYS wagging, and unfortunately that has led us to battle the dreaded “happy tail”. But it doesn’t slow him down at all. He is slowly discovering toys, so far, he just nibbles on the stuffed ones with no squeakers. He is also starting to play with us in the backyard. He LOVES to play with a ball. He pounces on it and throws it to himself. Troy loves going on walks. He also never met a stranger – old or young. He loves everyone and will greet them with his endlessly wagging tail. We have only had him a few weeks, but he has already learned so much. He has learned to be gentle when taking treats, and he has learned he has to be calmer at mealtimes. He is very easy to work with. He gets his teeth brushed every night, we Dremel his nails, and he gets regular baths. He is a champ at all of these things. He loves to be with people. He will follow us room to room. He would love to be up on the couch or bed snuggling with us, but that isn’t allowed as a foster. So we put a bed right next to the couch and he is happy laying there. Troy has no space issues. He is very patient. If you take too long doing something (getting ready for a walk, going to a different room, etc) he will get bored and sphinx and wait patiently. He also is a natural sitter. He will go outside and sit in the yard and just observe his surroundings. He is doing well learning to be left alone with another greyhound. An ideal home for Troy would be one with no cats or small dogs, a yard to play in, a canine companion and an active family with plenty of people to love.